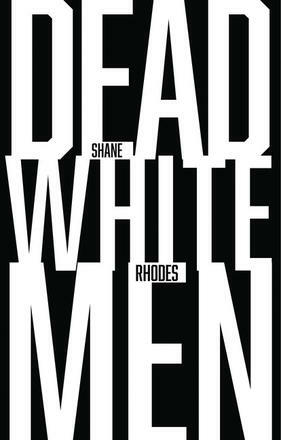 From the title of Shane Rhodes’s collection Dead White Men, we know we are in fraught if familiar territory. Those men are the subjects to be critiqued, argued with, taken down in light of today’s history. Read alongside the recent debate about Confederate statues, which includes actions such as painting Columbus’s hands red, Rhodes becomes an ally in an intersectional coalition that seeks to engage the higher faculties without neglect of the bodily drives. In that way, Dead White Men is as reasoned as it is passionate. Myths are skewered, words re-appropriated, archives punked, records reclaimed, origin stories destroyed. This is not only at the level of content, but language, form and page. In a beautifully produced volume, the text varies in font, size and scale. There are images scattered throughout, all in black and white, including some silhouettes and some photographic reprints. In that way, Australian readers will recognise similarities to Belli Li’s recent release Argosy. Colonial exploitation, conquest: discovery is as mercantile as it is ecological. A simple list becomes a solemn reminder of just what happened on the frontier. If we know anything then, it is that we know that colonialism is a litany of violence, blood and gore that is specific, taking in the metropolis and the frontier alike and animals along with people. : will you have this? The threat is here, but it is contained – one must infer that the music is used, that maybe the tongue is cut out. But in ‘Gold’ we are told in the opening line, ‘For it is beaten and we are beaten for it’. And that is where language differs from action, where the engagement of the word is not quite the same as the shovel, the pickaxe, the railroad. Both, though, are critical parts of narratives of exploration, invasion, colonialism. In other words, you must read between the lines, connecting the dots to make a structural critique. Given its stylistic variation – from erasure to aphoristic asides to lengthy narrative – Rhodes’s work is often subtle, which gives it the strength of reinforcing how insidious these historical realities were. With a similar gaze applied to our own time, one cannot help but speculate on how poets will be regarded in the future. What is the responsible path to take? How might we undo the machinations of history that are unfolding as we speak? What of the living white men who head our systems of power? Universal suffrage, interracial marriage, independent governance means we read Rhodes’s historical work as just that – history. And yet, these legacies extend to our everyday, which is why this work resonates. From its language, to its style, to its content, to its form, to its experiments, this is work that stay with you for a long time after you have been released from their strangling grip. This is work that articulates a higher consciousness of poetry and history, interrogating who we are and why we must continue to critique where we have come from, and the spaces we continue to occupy with an enlightened dialectic that knows that it too, even in the harsh light of day, is also barbaric. This entry was posted in BOOK REVIEWS and tagged Robert Wood, Shane Rhodes. Bookmark the permalink.